But there is a second process, called “Through-Air Drying” (TAD), that has become a second standard technology over the last two or three decades. In this process, the web is dewatered and dried by non-compressive means, thereby avoiding the compaction that occurs during wet-pressing of the web in the conventional process. The principle components in the TAD tissue making system are illustrated in Figure 1. There are usually two non-compressive water-removal operations used on the TAD machine: Vacuum dewatering and Through drying. The use of these non-compressive water-removal technologies results in a product with improved properties. Among these improved properties are bulk, CD stretch and absorbency. In North America more than 30% of the tissue production is now done on TAD machines, and several new machines are currently being installed. Even private label producers are installing TAD machines, indicating the technology has become standard, at least in North America. The improvement in the product properties of bulk and absorbency make TAD tissue production particularly suitable for rolled tissue products such as bathroom tissue and paper towels. Higher bulk allows the manufacture of a large-diameter and firm roll with less fiber compared to wet-pressed tissue; and higher absorbency leads to a preferred product, since absorbency is a key property for both bath tissue and paper towels. Improved durability via increased CD stretch is also valuable for tissue products, and TAD machines are thus utilized by some manufacturers, particularly Procter & Gamble, for facial tissue production. Fiber savings are possible for TAD tissue since the basis weight of the sheet can be reduced thanks to the higher bulk. Since fiber is usually the highest cost element in a tissue product, reduced fiber cost is the major advantage associated with the use of TAD technology. Despite the advantages in product quality, the TAD process suffers from the drawback of having high energy consumption compared to wet pressed. The high energy consumption is mainly due to the fact that the non-compressive dewatering means the drying is accomplished by hot air being pulled through the sheet, rather than pressing the water out. This makes TAD drying operations more energy intensive than wet pressing. As a result, in places like Europe where energy prices are relatively high, TAD tissue machines are far less common than in North America where energy is relatively inexpensive. The system for production of TAD tissue starts with fiber selection and pulping in a manner similar to the wet-pressed tissue machine. Both secondary and virgin fiber are used in TAD tissue. For high-quality consumer tissue products, 100% virgin fiber is normally utilized, and the tissue machine former often has layering capability such that a hardwood fiber (eucalyptus for the softest products) is put in the outer (consumer-facing in the finished product) layer. Softwood is included in the inside layer for strength, and for the highest-quality products Northern Softwood kraft pulp, such as spruce, is often used. For lesser-quality products recycled fiber can be used, and fiber selection is determined by the tradeoff between cost and the quality needed by the manufacturer. In general TAD products are marketed for the upper end of the market, and hence high-quality furnish is often used despite the higher cost compared to secondary fiber. The former for TAD tissue generally requires more sophisticated technology than on a wet-pressed tissue machine. The forming configuration is usually a twin-wire former with a solid forming roll. The forming fabrics must be extremely high mesh count to ensure good fiber support, as excellent formation is important for TAD products. The web is formed at an initial consistency of approximately 0.1% solids (1000 pounds or kg of water for a single pound or kg of fiber). The rest of the machine then dries the web to the final required dryness, with final moisture levels generally 5% or less, depending on the product. To begin the process of removing water from the nascent web, there are vacuum boxes in the forming section. A vacuum box consists of a solid member with slots or holes to allow water flow, and the vacuum box is connected to a vacuum source such as a Nash-style vacuum pump. The pump draws a vacuum, causing air to flow through the sheet and into the vacuum system. The air flow entrains water, thus removing it and increasing the dryness of the web. At first the water is easily removed from the web, so relatively low vacuum levels can be utilized. The cost of vacuum dewatering is relatively low, though still much more expensive for a given moisture level than pressing the water out in the wet-pressed process. As water is removed from the sheet it becomes increasingly difficult to remove the remaining water, so successive vacuum boxes are operated at high vacuum levels. Often the last vacuum box will be operated at approximately 20 inches of mercury, or 0.68 bar vacuum, to induce significant air flow through the sheet, maximizing the ability of the air to strip water from the fibers. The objective of the dewatering zone is to increase the consistency of the web to at least 25% before the sheet is transferred to the TAD section. Note that 25% consistency equates to 3 pounds of water per pound of fiber, so there still is a significant amount of water to be removed in the drying section. The exact consistency achieved in the dewatering zone is a function of many variables including the size of the vacuum pumps, the characteristics of the fiber being dewatered and the speed at which the web is travelling. To enhance sheet strength, instead of refining the fibers, TAD tissue products often contain a dry-strength additive. This is preferred for adding strength, as refining increases the tendency of the fibers to retain water, thus making the dewatering operation less effective and more expensive. The web is then transferred to a TAD fabric using a vacuum box or a vacuum roll to transfer the web. The TAD fabric design varies significantly depending on the characteristics of the product being made, but it is generally much more “open” (higher permeability, via a lower mesh count) than a forming fabric. The TAD fabric carries the web over one or more through-air dryers and to the Yankee dryer. During sheet transfer to the TAD fabric, the vacuum box or roll can be used to mold the sheet into the TAD fabric. The TAD fabric can have a 3-dimensional character to maximize the amount of sheet molding that occurs on the TAD fabric. This increases the apparent bulk of the web. In some cases the web is transferred to the TAD fabric with a speed difference between the forming fabric and the TAD fabric loop. This is called “wet-micro-contraction” or “rush transfer” and is used to put machine-direction stretch in the web. The generation of machine-direction stretch via wet micro-contraction reduces the need for stretch generation in a subsequent process step. Once the sheet is on the throughdryer fabric, the mechanism for TAD drying is to draw hot and relatively dry air through the web. This hot and dry air comes in contact with the water in the web, and moisture is transferred from the web to the dry air. The hotter and dryer the air, the more moisture will be removed from the web for a given air flow rate. 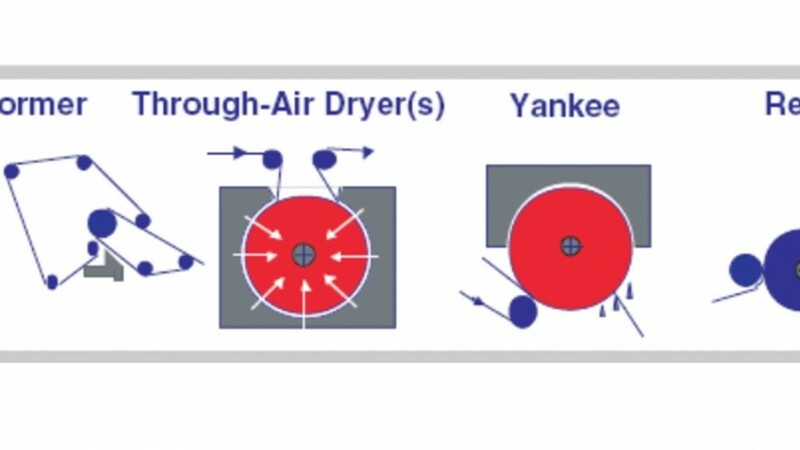 The TAD system must provide sufficient air to dry the web from the incoming consistency to the desired consistency for transfer to the Yankee dryer. The necessary consistency exiting the TAD(s) is usually at least 70 percent and may be as high as 95% consistency, so the TAD system must remove roughly 2.5-3 pounds or kg of water per pound or kg of fiber. The TAD system must be large and very efficient to dry the web which is travelling at a speed as high as 5,000 feet or 1,500 m per minute. 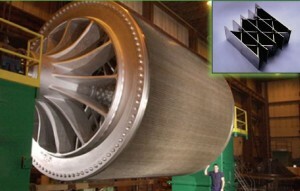 As the residence time on a typical 16-foot TAD cylinder is less than one second, extremely high drying rates are required, and the TAD system must be designed to provide this high drying rate. 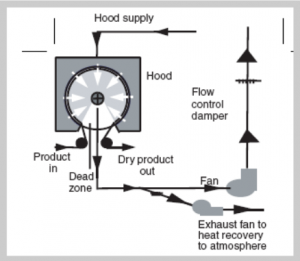 Figure 2 shows a schematic of the air flow around the TAD cylinder and hood. Figure 2. Through-air drying process flow sheet. The principle components of the system are the TAD cylinder, the hood and the air system. The TAD cylinder must have a very high open area, without compromising structural rigidity or reliability, in order to allow air to easily flow through the web to facilitate drying. The TAD cylinder usually has a honeycomb design as shown in Figure 3. Open areas of 85-95% are necessary to achieve uniform drying, product quality, and operating efficiency. Other considerations impacting the TAD cylinder design include ensuring uniform air delivery to and flow through the sheet, maintaining uniform drying temperature, the basis weight and permeability of the sheet, and the moisture content of the sheet and fabric entering the cylinder. The TAD cylinder is surrounded by a hood, which covers the vacuum arc of the roll. This arc defines the drying zone of the process. The hood is supplied with relatively hot and dry air and is slightly pressurized relative to the interior of the TAD cylinder. The hood incorporates design features to give uniform air distribution of the heated process air. Stationary vacuum seals within the cylinder assembly establish the cylinder’s vacuum arc in the cylinder. A vacuum established by the main recirculation fan draws the heated process air through the web. The direction of the airflow is usually from the hood, through the sheet and fabric, to the interior of the cylinder. Water is transferred from the web to the heated air in what is essentially an adiabatic saturation process. The air passing through the web exchanges heat to the web and receives moisture from the web such that the post-web air is relatively cool and damp. A portion of this high-humidity, cooler air (roughly 25% of the total), is exhausted from the system by a small exhaust fan. The rest of the air remains within the system and is eventually recirculated back through the web. A quantity of fresh air is added to the system, and both the fresh air and recirculated air is then heated, typically by direct-fired gas. This raises the temperature of the air, and the fresh air lowers the humidity of the combined stream. This hot, relatively dry air is then fed to the hood. The temperature of the air in the hood is usually around 400F/200C and is limited by the temperature to which the TAD fabric can be exposed. Hydrolysis of the TAD fabric is usually the limiting factor in TAD fabric life. Hydrolysis increases with increasing temperature, which limits the supply air temperature to roughly 400F/200C. As previously mentioned, the web dryness after the TAD section is approximately 75-90% consistency. After throughdrying, the web is transferred to a Yankee dryer where the final drying and creping is done. Since the web is transferred to the Yankee from an open fabric rather than from a felt, adhesion of the web to the Yankee is less than in the wet-pressed process. As a result, the TAD fabric is often sanded on the paper side to get a surface area of 20-25%, which is important for sheet transfer and adhesion. Since the sheet consistency is at least 75%, less drying from the Yankee is required. Even though the contact between the sheet and Yankee is limited to the sanded regions of the fabric, the necessary drying can be accomplished at high speeds. As in the wet pressed process, the Yankee typically has a high-velocity hood, which accomplishes a high percentage of the necessary drying given the lesser sheet contact. While on the Yankee cylinder, the web is creped in a manner similar to that for the wet-pressed process. Due to the limited web contact, the creping may not be as efficient. However, the lower density of the web, due to the absence of wet pressing, means sufficient creping can be achieved to soften the web and to put in the necessary machine-direction stretch. After the Yankee dryer the web is wound into a large roll. The reel may be a standard reel, as described in the wet-pressed section, or a “belted” reel which improves winding and turn-up efficiency. In the belted reel the winding of the sheet is not made against the reel drum, but is instead made against a fabric, as shown in Figure 5. The building roll deflects the fabric, and the deflection is measured and kept constant. The reel has linear movements with position control, instead of load control, in both the primary and secondary system. In the secondary system the carriages are equipped with center-wind assist. The process described above is the standard creped throughdried process. However, many variations of this process have been developed by various companies. An example of significant variation is the uncreped TAD process (UCTAD) developed by the Kimberly-Clark Corporation. In this process, the Yankee dryer is removed from the process, and the web is dried to final dryness in the TAD system. Since there is no Yankee dryer, and hence no creping, all the machine-direction stretch is put in at the rush-transfer step where a significant amount of speed differential between the forming fabric and a subsequent fabric is utilized. This simplified process leads to higher productivity and no reduction in caliper (bulk) associated with the pressing of the web during transfer to the Yankee. Potential negatives associated with this process might be the necessity of drying the web to the final dryness in the TAD section and the loss of softness generated in the creping step. As described above, the TAD process for tissue gives key product advantages relative to the conventional wet-pressed process. However, energy consumption is higher, and the process is more complex. In many cases, the product advantages, particularly bulk generation, justify the higher cost of the TAD process. In North America where energy costs are low relative to Europe, TAD tissue is becoming standard for rolled products such as bathroom tissue and towels. In places where energy is relatively expensive, the conventional wet-pressed process remains dominant. Changes in fiber costs, energy costs, and/or consumer preferences can strongly affect the relative value of the TAD process versus the wet-pressed process. A tissue manufacturer must make a well-thought-out decision when choosing one technology over the other given that tissue machines have a very long life span, typically 50 years or more.